Li Gong was born in central China and came to the U.S. in 1995 to pursue graduate school. He earned his Ph.D. from Stanford University in 2001, was an assistant professor at the Ohio State University and played the roles of research scientist and VP of product management at SAP Labs. His aspiration has been combining beautiful things, healthy things and positive social change in what he does. Thus he founded Encha in Nov. 2014 to offer Encha Organic Matcha to help many people enjoy the benefits and taste of high-quality organic matcha and change the old coffee or tea bag culture. What makes life meaningful to me is to pursue a higher state of living. Strive to be better. Make the world a better place. Connect myself with a broader collection of beings. Making these changes and enjoying the exploration is what I do the best and what I enjoy doing. From my self-observation, I feel I am very good at striking a balance between analytical and creative. I always love beautiful things, healthy things and positive social change. When I discovered the health benefits of matcha and tasted naturally tasty and beautifully green organic matcha in my farm discovery in Japan, I felt the epiphany that it is it. Founding Encha and offering Encha Organic Matcha to people gave me the precious opportunity to combine beautiful things, healthy things and positive social change in what I do. I am very grateful. I don’t typically reflect on the past, writing down my success or failure. I do reflect to help me strive forward. Resilience and clarity of life goals are very important for achieving success. One challenging moment I had was in my second year at Stanford. The professor I was working with me somehow didn’t like me. So I received poor ratings. I talked to another professor who I really liked, Professor Cliff Nass. Cliff was very popular and busy supervising a lot of graduate students. He didn’t give me a quick answer of yes or no for taking me on. He gave me a research project to tackle. I finished it as a super-fast pace with very good result. Cliff thinks and works very fast. So I am glad I was able to synch with his way of thinking and working. I am very grateful to him for mentoring me and bringing me to the achievement of finishing my Ph.D. and finding my first job. Unfortunately he died of heart attack at the age of 55 a few years ago. Very sad. He didn’t have a healthy diet and started to exercise only later on. I miss Cliff and pray to his soul. If you want something, you have to make it happen. It won’t drop from the sky. I admire Steve Jobs’ smartness and creativity. I revere Dalai Lama’s compassionate heart and wisdom. I feel joy each time when I visit our organic matcha tea field. What we might normally brush aside as plants can offer so much. The effort that our organic farmer has put in to farm organically teaches me gratitude deeply and raises the issue of economic and environmental sustainability at a very heightened level. 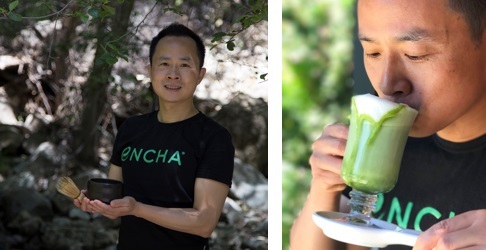 I drink my own Encha Organic Matcha twice a day, in the morning as my wake-up ritual with a bowl of Ceremonial Encha tea and after lunch to explore various healthy and fun ways of drinking Encha. My current passion is to support more people to discover and enjoy the benefits, taste and ritual of drinking Encha Organic Matcha and help push worldwide organic transformation.